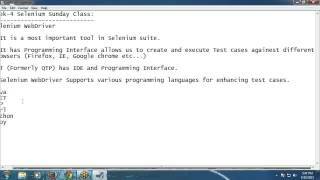 > It is a most important tool in Selenium suite. > WebDriver supports various programming languages to enhance Test cases. > WebDriver supports various operating environments to create and execute test cases. > WebDriver supports Data driven testing and Cross browser testing. > WebDriver is faster than other tools in selenium suite. > WebDriver supports parallel test execution with the help of either JUnit or TestNG framework. > WebDriver doesn’t have built in Result reporting facility, provides summary only. (* With help of JUnit or TestNG we can generate HTML test reports. > No object Repository in selenium Webdriver, so no centralized maintenance of objects. Using Element locators, Webdriver methods and java programming features we can create and execute Test cases. > Java programming features: To enhance Test cases. > TestNG Annotations: For grouping test cases, parallel test execution and generating test reports.